I tried. Honestly, I tried. For a week now, I've been skittering around the floor holding a sign that read: Attention fleegle! It't time for a blog post! Unfortunately, fleegle merely smiled absently in acknowledgement, and then wandered away to do who knows what. Well, this morning, I really lost my cool. Well, a little bit of my cool, because I am too cool to lose all my cool, as you all well know. 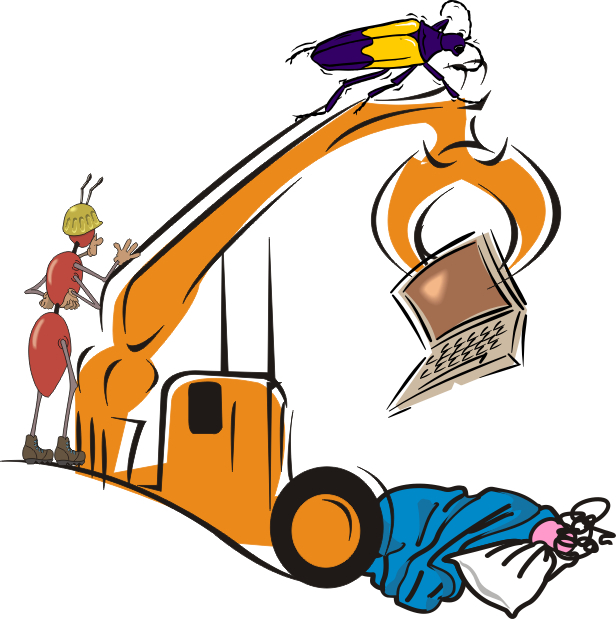 Enlisting the aid of a few friends, we attached fleegle's laptop to a crane, levered it over the bed where she slothfully lay sleeping, and mostly carefully lowered it onto her person. 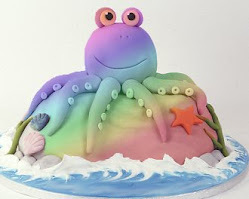 I regret to say that, after the cable slippage, fleegle did wake up and pay attention, but the Raid attack was not exactly the result we were looking for. So, I, Harry, will write the blog post instead. First, I have here fleegle's Owl sweater. Very soft and warm. 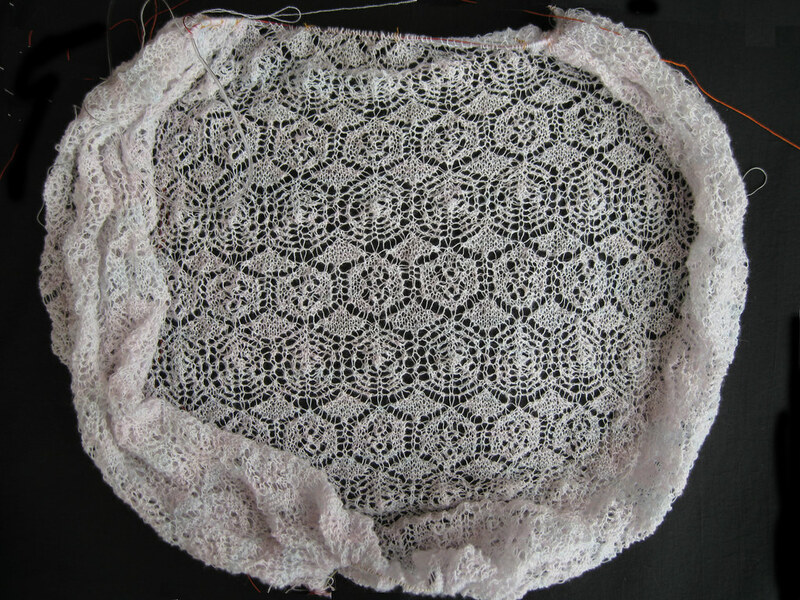 And actually pretty well knitted for a human. I have her knitting notebook right here, so let me flip through the pages and see what she made this thing out of. Size 5/7 needles, white Yubina Bulky cashmere knitted with one strand of Colinette Paresienne in the Marble colorway. 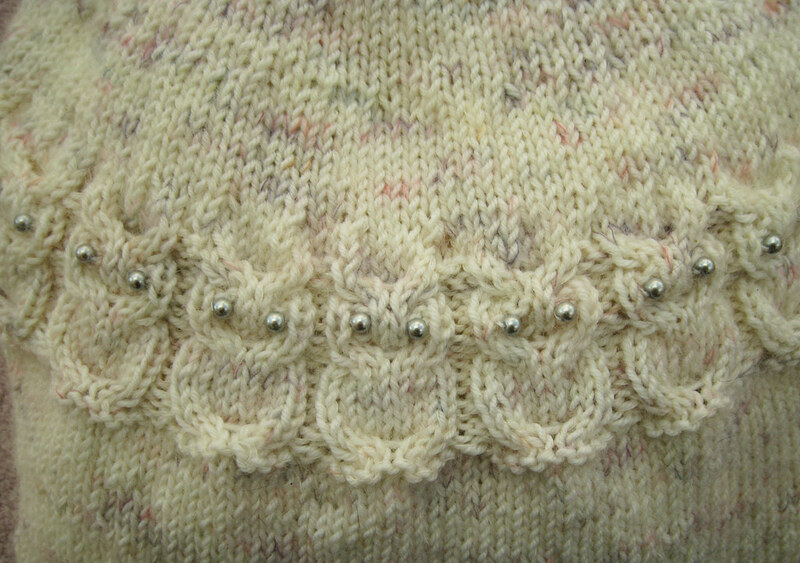 Simple bottom-up seamless yoke sweater pattern made with Knitware. Owl cables from an old Mary Thomas book. Pearl beads from somewhere. Time: 6 days. 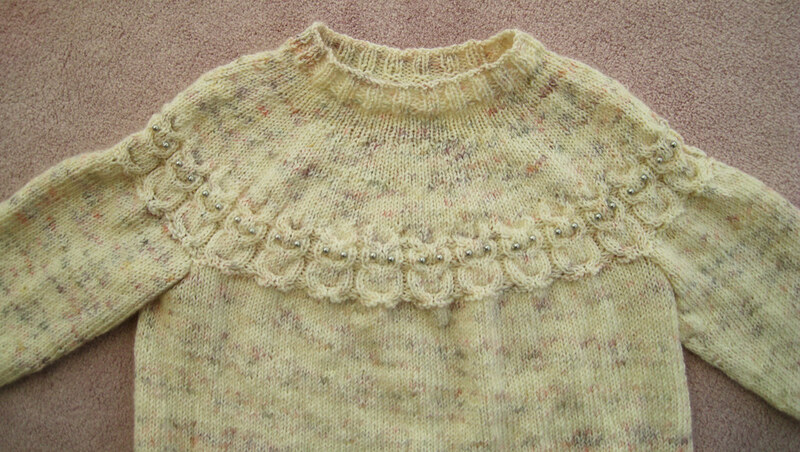 Piled on top of the owl sweater were several skeins of handspun. Rather nice handspun. In fact, the yellow merino yarn makes an excellent mattress for yours truly. Not much in terms of notes, I'm afraid. The orange is merino/silk from Corgi Hill, the yellow merino is from Funky Fiber, and the lovely black merino/angelina sparkly stuff is from Bohemia Fibers. All these were spindle-spun, but there is no indication which spindles she used. Sloppy record keeping. And lastly, I dragged fleegle's Queen Susan out of the tacky plastic bag and spread it out the best I could. So far, it looks like she's half done with the center and, to my surprise, there is not a single coffee stain on the entire thing. Had I been knitting it, I am sure it would have looked better, but this, after all, is about fleegle's knitting, so I am trying to be nice. It is not easy after spending two hours in the shower to remove lingering Raid fumes.